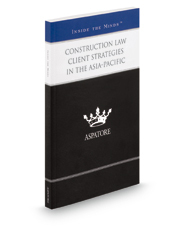 Construction Law Client Strategies in the Asia-Pacific is an authoritative, insider's perspective on assisting construction companies and subcontractors with the legal aspects of doing business in the Asia-Pacific region. Partners from leading law firms guide the reader through the latest trends in each of the featured countries and highlight the role lawyers can play in helping clients navigate the current construction environment. These top lawyers examine the construction industry in Taiwan, Malaysia, and Hong Kong, and also take a broader look at the Asia-Pacific region to address concerns that may come up in other countries. From complying with local government regulations to understanding cultural issues in contract negotiation, these authors share their thoughts on avoiding risk and conflict while embarking on productive construction business. The different niches represented and the breadth of perspectives presented enable readers to get inside some of the great legal minds of today, as these experienced lawyers offer up their thoughts around the keys to this rapidly changing practice area.